Having initially been founded in Austria back in 1990, Interwetten is now a company located in Malta, one of the biggest betting hotspots in the world. The organisation initially took bets over the telephone, up until 1997, when they became the first company in the world to start offering online sports betting. Now with a customer base of almost 500,000 users, Interwetten are operating in 70 countries, thanks to a license from the Malta Gaming Authority. Interwetten has made a name for itself thanks to competitive odds, their range of sports markets and additional features, helping them to become one of the most popular online bookmakers around today. Interwetten currently sponsor many sports teams, competitions and organisations, including the Moto GP World Championship and top football teams such as Sevilla, Fiorentina, Espanyol and Stuttgart. They also hold an international rights deal for advertisement during Europe League, World Cup and European Championship qualifying matches, helping to further demonstrate their standing within the market. Despite Interwetten also offering casino, live-casino, games and virtual sports platforms, it is their sportsbook that we will be concentrating on during this review, as we have put all areas of their operation to the test. From markets to customer service and from banking to bonuses, we have all bases covered, meaning that you will have an excellent understanding of Interwetten come the end of this review. With 28 sports markets to choose from in total, Interwetten cover all of the most popular events around, as well as some of those that are becoming more common with bookmakers. As with most online bookmakers, the likes of football and tennis are the most popular, with horse racing perhaps surprisingly missing out at Interwetten. Despite this, you can certainly tell that Interwetten have a wide variety of customers from around the world, with the likes of ice hockey, basketball and American football also covered in detail. Meanwhile, sports such as boxing, golf, handball and volleyball help to make up their entire selection, with these sports being popular in the UK, Germany and Switzerland, where the majority of Interwetten customers come from. As the most popular betting market at Interwetten, it is little surprise that football is covered in great detail, with all major league and competitions available, as well as some more obscure matches from around the world. 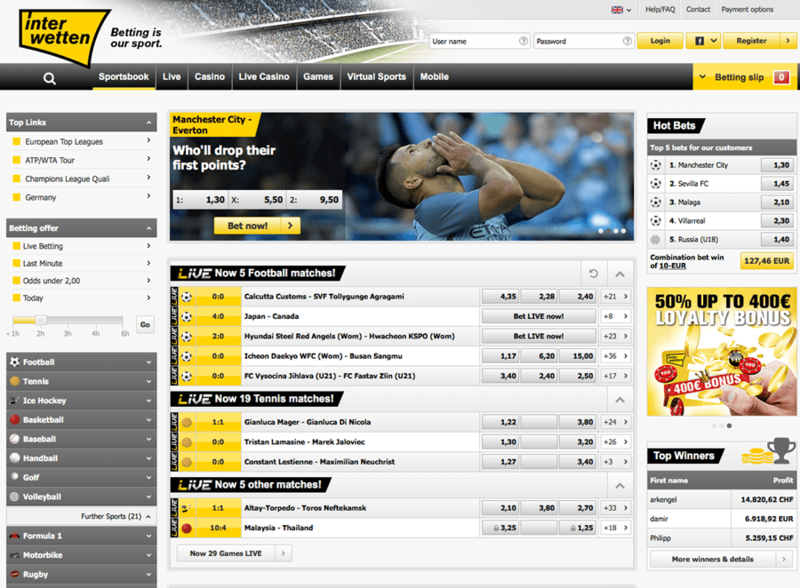 As a result, whether it be the English Premier League, UEFA Champions League, African Cup of Nations or the Swedish Allsvenskan, Interwetten have all areas covered for their users. Despite this, the number of bets available per game will perhaps come as a disappointment to some, with our review finding just 22 additional markets for Premier League matches, compared to 70+ at their competitor’s sites. However, they do include correct scores, under/over, Asian handicap, time of first goal and a select few other markets for high-profile matches. Basketball markets are also a major positive at Interwetten, with their coverage extending from the NBA to EuroBasket and from the Korean KLB to the German BBL. Matches from such competitions are generally provided with 16 additional bets, which again is a little fewer than the market leaders. Despite having once struggled in this area, Interwetten are now able to compete with some of the biggest names around when it comes to their odds. Although still not the highest within the industry, Interwetten offer appealing odds on the favourites for sports events or matches, which is something in which you rarely see. So, whether it be backing Real Madrid to win the Champions League or Roger Federer to win Wimbledon, you are likely to be impressed by the odds available at their sportsbook. The profit margin at Interwetten is attractive to, sitting at around 12% for football, which is around the industry average. However, for those looking to back underdogs and win big this way, Interwetten is probably not the betting platform for you. Elsewhere, betting limits are not the highest at Interwetten, however they can be raised upon request when talking to a member of the Interwetten customer service team. The main area of concern for any betting customer is how quickly and easily they can access their favourite sports markets. It is safe to say that Interwetten have made this process fairly straightforward, with the user-friendliness and design of their website being positive in general. Despite not being as quick as some other platforms, with our test showing some lagging in certain areas, Interwetten do provide an efficient sportsbook to their customers. 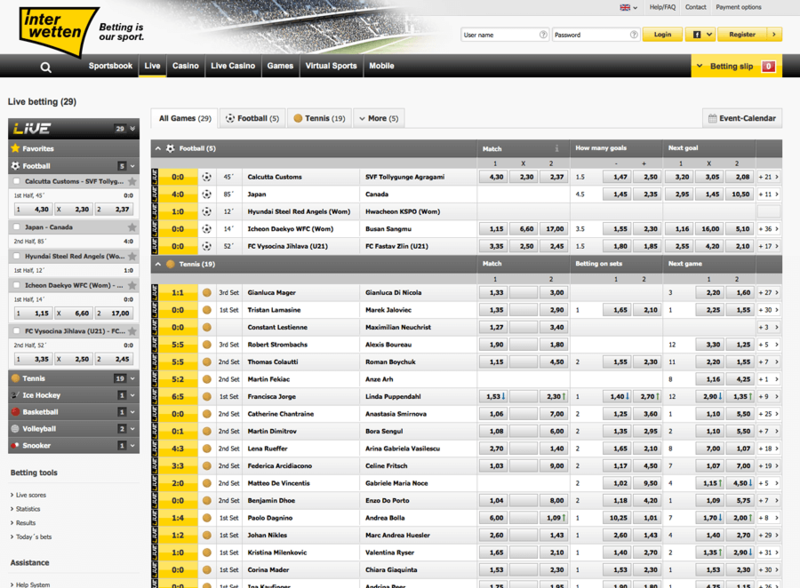 Elsewhere, and as with the majority of online bookmakers, a menu placed on the left-hand side of the page allows users to easily navigate between different sports, with the most popular markets listed at the top of the screen. 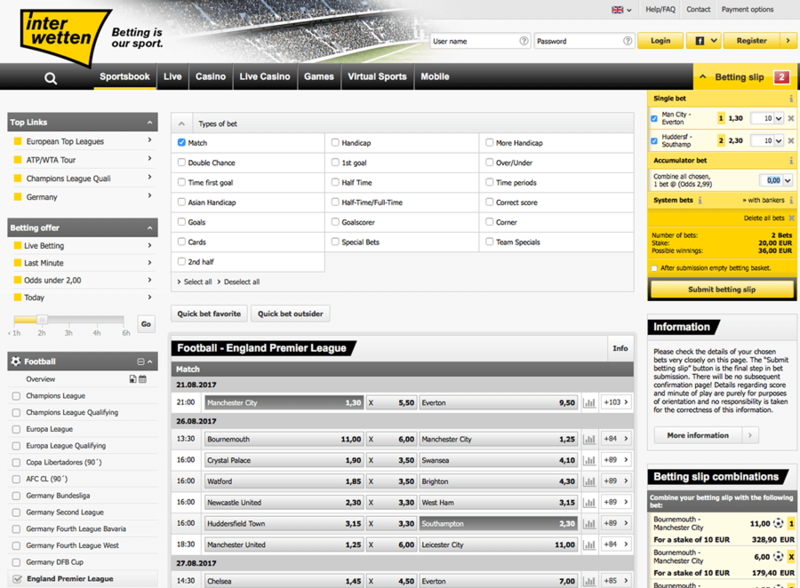 Meanwhile, in the middle of the page, customers will find the most popular leagues and events from the sport in which they have selected, while an automatically updating betting slip is located on the right. This allows customers to keep a track of their betting selections, as well as choosing what type of bet they wish to place and view their potential returns from the stake inputted. The bet slip is inspired by Gamebookers, one of the most recognisable names within the industry. With their betting platform available in a range of languages, including English, German, French and Spanish, there truly is a real international feel to Interwetten’s site. Thankfully, Interwetten do not overload customers with unnecessary graphics or data, with the simplicity of their site one of the major positives coming out of this review. Meanwhile, for customers looking to bet away from their desktop, Interwetten have both designed and introduced a mobile app to the market, perfect for wagering on the go. Available for both iOS and Android users, the download process is efficient too, with users able to find links via the Interwetten website or by searching in their relevant app stores. Unlike their main desktop site, the Interwetten app is actually supremely quick, with bets able to be placed in just a matter of seconds. The fact that it holds all of the same services and features as found on their main site, means that it is even a viable option to become your main betting platform. However, for those who do not wish to download the app, Interwetten have developed a completely mobile-friendly site, meaning that users have more than one option when looking to place bets using their mobile devices. Interwetten will 100% match any new customer’s opening deposit up to a maximum of 100 Euros, which is certainly an attractive proposal when compared to the rest of the industry. This means that customers can quickly double their account balance in just a matter of seconds, setting them up perfectly to kick-start their betting strategies with Interwetten. However, with just 14 days in which to rollover the deposit amount at least five times, at odds of 1.70 or more, there bonus does come with stricter requirements than many other bookmakers. Available to all customers with no promo code required, Interwetten’s welcome bonus is still worth taking advantage of, despite its difficult requirements. The majority of customers are catered for at Interwetten when it comes to payment methods, however be sure to look out for additional fees. At their sportsbook, desired withdrawals are dealt with promptly, often as quickly as the depositing of money, which will come as a surprise to some of the more experienced punters out there. However, unfortunately there is an additional charge in many cases at Interwetten, which will perhaps put some off. Between 2%-3%, such fees can quickly become an issue for those looking to make regular withdrawals. 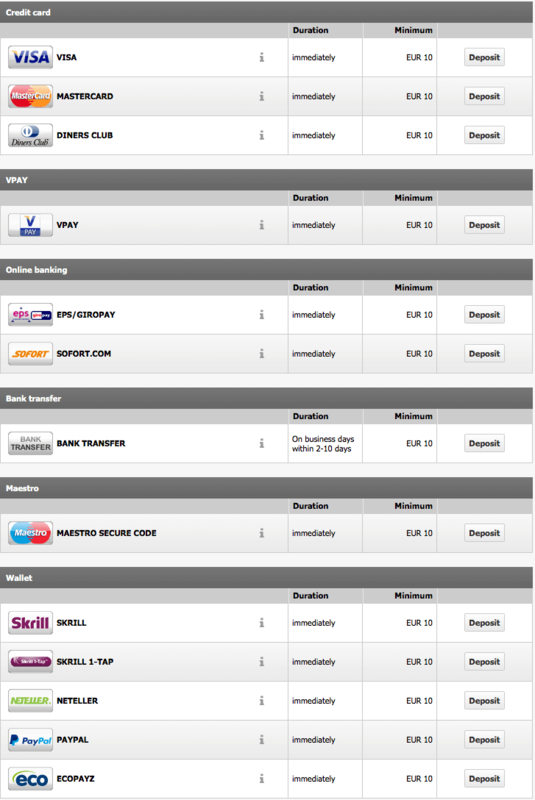 Deposits at Interwetten can be made using major credit and debit cards, as well as Neteller, Skrill and prepaid service providers including Paysafecard andUkash. It is also worth bearing in mind that initial deposits at Interwetten must be done so via a bank account for security reasons. However, after this point the customer is free to choose from any available method. Customer support at Interwetten is among the most efficient around, with their knowledgeable and professional agents on standby 24 hours a day in order to help users overcome any issues or problems in which they may be having. Despite only being available via a Maltese telephone number, which can sometimes result in additional costs, and via email, response times are generally very good, with issues normally dealt with within just 24 hours, although sometimes this is even quicker. Interwetten have even won awards in the past for their customer support, and despite not being as detailed as others, is still hugely effective. If Interwetten could look into the possibility of adding a hugely popular live-chat feature to their service then it would undoubtedly be one of the best around. Interwetten are undoubtedly one of the up and coming sportsbooks on the market today, having already achieved a great deal in the industry. Despite not being able to compete with the very biggest names when it comes to their services and features, Interwetten do have great experience within the field, and have made vast improvements in recent times. Their betting platform is easy to use, albeit a little slowly, with markets, features and the bet slip neatly located around the page. Coupled with their excellent range of sports markets, Interwetten are likely to cater for a wide variety of customer demands. One of the only negative factors concerning their selection is the absence of horse racing, which has long been a firm favourite among betting customers. However, the sports that they do cover are generally do so in good detail, with football and tennis featuring heavily. Elsewhere, high minimum withdrawal amounts will be of concern to some, while betting limits could also be improved. Despite these flaws, Interwetten is certainly a solid option for many punters, no matter what type of customer you may be.